EX5 Tour Grind Wedges feature square grooves for maximum spin and ease of play. 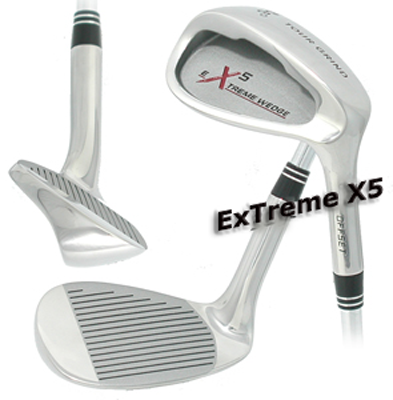 The Extreme X5 wedges are designed with a major on-set (face forward) design. By moving the face of the wedge forward of the hosel a shanked shot is eliminated. An added bonus of the onset head design is that these clubs are very easy to hit out of the long grass. The face makes contact with the ball before the hosel can get caught up in the grass, thereby reducing the chance of twisting the club for an offline shot. W-SSX5-052 RH-LH 52° Wedge 52° 65 d 303 -22 mm 10 d 35.5 in 0.370"
W-SSX5-056 RH-LH 56° Wedge 56° 65 d 308 -26 mm 12 d 35.5 in 0.370"
W-SSX5-060 RH-LH 60° Wedge 60° 65 d 308 -27 mm 6 d 35.5 in 0.370"